-An optional digital anatomy library with over 120 pathological examples. The data are from real patient scans or cadavers, and thus highly accurate. The Anatomage Table is the only system that can display true human gross anatomy in real life size. It makes for an excellent advanced education tool as well as a technical showpiece. With powerful radiology workstation features, it can be used for radiology, surgery case review, patient consultation, and research purposes as well as anatomy education. 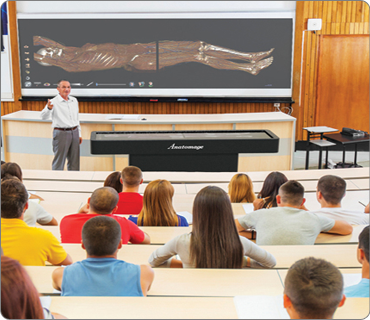 The Anatomage Table can be used directly during lectures since it connects to projectors. Instructors can create and demonstrate procedural material, making lectures more dynamic and engaging to students. The Anatomage Table is an excellent supplement or replacement to cadaveric studies. With the segmentation features, each system or anatomical structure can be separated and reviewed individually. The Anatomage Table is simple to operate and over time will save customers money. There are no recurring costs or disposal concerns like traditional cadaver labs. Likewise, costly chemicals or ventilation requirements are not required and the virtual cadavers can be used repeatedly for safe and consistent performance year after year. 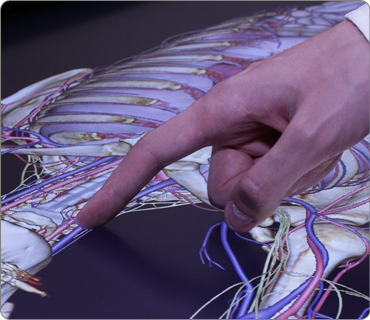 The Anatomage Table opens any medical imaging data and provides high quality interactive 3D renderings. 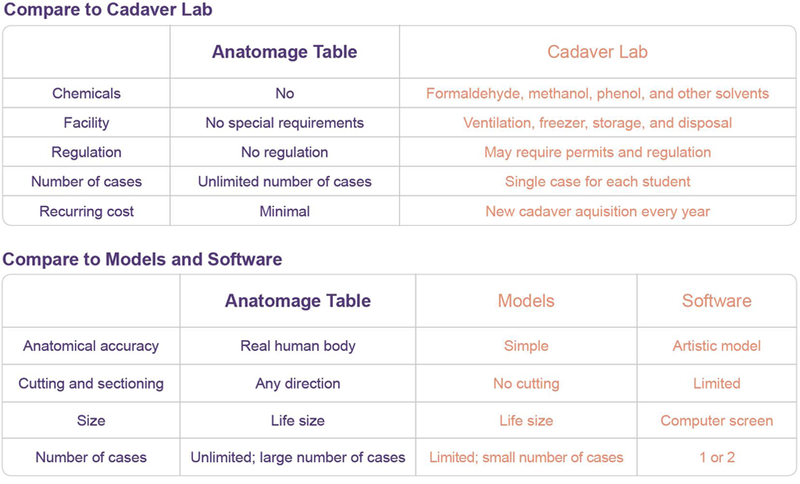 Whether it is your own scan or one of the Digital Anatomy Library cases, the Table shows full 3D anatomy that can be intuitively controlled. Anatomy and radiology can now be seamlessly introduced and integrated in the same course. The Anatomage Table has an optional digital library module that includes over one hundred twenty pathological examples, allowing students to not only dissect normal gross anatomy, but also experience abnormal pathologies. For a list of anatomy cases, feel free to email your Anatomage representative. 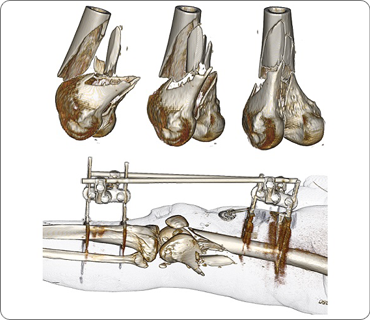 The Digital Anatomy Library features rare and clinically relevant data sets of real patients. Anatomage Table users can explore bone fractures, aneurysms, carcinoma, and dozens of other unique case examples. And because the anatomy is from medical imaging data, students are presented with the most accurate representation possible. Each patient case comes with a full radiology report to give context to the student. Many of the patient scans included in the Digital Anatomy Library showcase medical devices. Instructors can demonstrate to students of all ranges the location and functions of stents, clamps, implants, and grafts. The 3D patient scans can be cut and rotated in any direction to truly show medical devices in a new and intuitive way. The Digital Library offers comparative study cases with synchronized dissections of multiple cases. 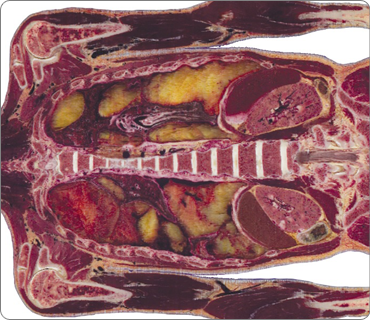 Open three regionally specific patient cases simultaneously and see how it is a great tool for studying comparative anatomy. 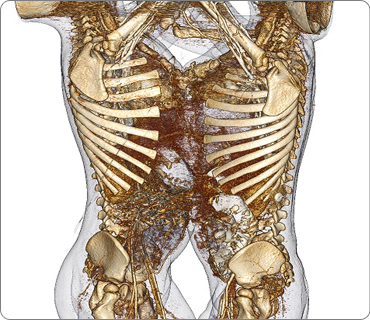 As part of our commitment to pushing the bounds of digital scan imaging, Anatomage has added 4D scans to the latest Anatomage Table offerings. Users with the Digital Anatomy Library can visualize respiration and beating heart scans with full interactivity. Users can even cut into and manipulate the scans while retaining motion capabilities. Anatomage offers a comprehensive solution for Implantologists. We are consistently recognized as a market leader in 3D diagnosis and treatment planning. Anatomage Guide is setting the standard as the premium product and service. Our award winning Invivo5 software and Anatomage guide compose the most technologically advanced solution designed to make your practice more efficient and accurate. High quality volume rendering delivers the full resolution of the density spectrum. Clearly visualize bone density, cortical bone boundaries, and the sinus. Quickly remove noise to effectively visualize the image. Immediate implant planning without conversion. 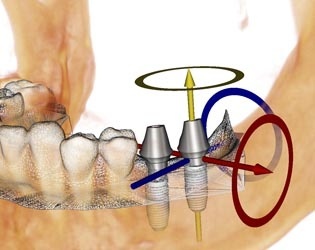 Restoratively driven implant planning with full CAD/CAM integration. 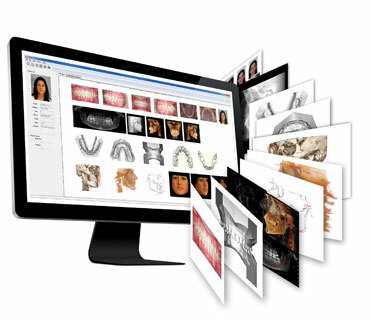 Anatomage offers a comprehensive solution for orthodontists. We are consistently recognized as a market leader in 3D diagnosis and treatment planning. Our high quality Anatomodels are setting the standard as the premium digital study model service. Our award winning Invivo5 software and Anatomodel service compose the most technologically advanced solution designed to enhance the clinical treatment of your patients. Easily determine the minimum area and total volume of your patient's airway. Clearly visualize impacted teeth and create a virtual TAD treatment plan. Automatic segmentation quickly identifies the temporomandibular joint. Superimpose two scans to determine treatment plan progress. Dynamic digital study models quickly created from your CBCT scan. Enhanced visualization for bracket positioning. Treatment plan with real patient root. True 3D ceph analysis compatible with traditional 2D tracings and analysis. Advanced landmark detection tools make it easy to train your staff. Trace directly on the volume to improve accuracy and visualization. Create or customize your own analysis and measurements. Apply a face photo-wrap for each patient. Anatomage offers a comprehensive solution for general practitioners. We are consistently recognized as a market leader in 3D diagnosis and treatment planning. Anatomage Guide is setting the standard as the premium product and service. Our award winning Invivo5 software and Anatomage guide compose the most technologically advanced solution designed to make your practice more efficient and accurate. Accurately place and adjust implant position in seconds. Experienced consultant to help plan your cases, free of charge. Anatomage offers a comprehensive solution for periodontists. We are consistently recognized as a market leader in 3D diagnosis and treatment planning. Anatomage Guide is setting the standard as the premium product and service. Our award winning Invivo5 software and Anatomage guide compose the most technologically advanced solution designed to make your practice more efficient and accurate. Anatomage offers a comprehensive solution for oral surgeons. We are consistently recognized as a market leader in 3D diagnosis and treatment planning. Anatomage Guide is setting the standard as the premium product and service. Our award winning Invivo5 software and Anatomage guide compose the most technologically advanced solution designed to make your practice more efficient and accurate. Clearly visualize tooth roots, impacted teeth, cysts, and tumors. Quickly identify and trace the incisive canal or inferior alveolar nerve. True 3D cephalometric analysis compatible with traditional 2D tracings and analysis. Advanced landmark detection tools make it easier to train staff. 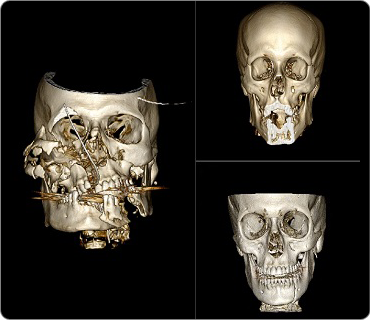 Plan virtual treatment objectives for 2D orthognathic cuts. Invivo5 is the most preferred software for CBCT users. Invivo5 sets the bench mark target for other software. Invivo5 has brought 3D innovations that set the standard in the current industry. Used by major CBCT manufacturers, major academic institutions, top private practices, opinion leaders and researchers around the world, the Invivo5 software has become the market leader. Invivo5 is comprehensive and covers all clinical applications such as Implantology, CAD/CAM, Orthodontics, Oral Surgery, Periodontics, Prosthodontics, Radiology, Medicine and General Science. Invivo5 broadly covers diagnosis, treatment planning, custom appliance ordering and cloud data Users don't need to switch to another 3D software for each task. Invivo5 can cover the entire work-flow. 3D imaging is complex, many software claim to be easy to use but there is only one experts agree is easy to use. With intuitive software like Invivo5, you will be spending less time figuring it out and more time doing exactly what you want. The intelligent design of Invivo5 allows clinicians to intuitively utilize it immediately. Anatomage is famous for its high quality volume rendering. Anatomage is the first company to introduce the current 3D volume rendering that is widely used in the dental industry. The volume rendering shows the clear internal structure such as teeth root, bone, sinus and airway. Invivo5 offers even better visualization options visualizing the surface of the bones, TMJ. Invivo5 can render the highest resolution possible in CBCT in to full accurate volume rendering with smooth and fast performance. This translates into very accurate fast diagnosis without struggling to get the right view. 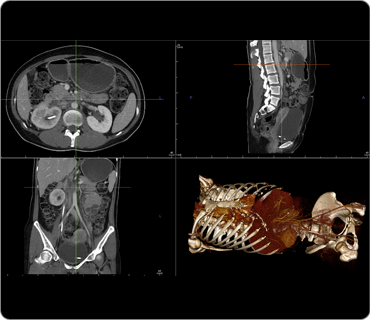 Compare Invivo5 to any other software, and you can easily see why Anatomage’s rendering is superior. Invivo5 is used for medical radiology diagnosis. It opens Medical CT, MRI, Dental CBCT or any other medical images in the standard DICOM format. It has easy and versatile Radiology layouts for implant assessments, impactions, TMJ workups, sinus evaluations, and airway assessments. Create traditional reconstructions such as Panoramic and Cephalometric images. Print images in 1:1 life size formats with customized logo options and image notations. Easily share cases with other doctors with the free Invivo Viewer. Visually impressive implant planning that’s easy to accomplish makes Invivo5 the most popular implant planning 3D software. Invivo5 allows the placement of implants directly into 3D DICOM data, with no conversion or modeling necessary. Design custom abutments that can be exported and directly integrated in to a milling system. Treatment plan implants and restorations for bridges, dentures, immediate provisional cases, and more. Immediate implant planning makes Invivo5 a very powerful patient consultation and communication tool that can be used chair-side. Anatomage’s own surgical guide will then take your virtual treatment and make it reality. The implant tab's video tool automatically creates a simulation of the implant placement. Just edit your parameters and you will be ready to capture a video for implant case presentation. Invivo5 offers powerful innovations for orthodontic practices. It allows impression-less root form dental models with AnatoModel: An impression-less study model created from CBCT scans that contains not just crowns but roots, developing teeth, impactions and alveolar bone. 3D face with regular digital patient photographs. Advanced 3D cephalometric analysis shows easy and accurate true 3D analysis. With the 3D Analysis module clinicians can create their own 3D cephalometric analysis that is compatible with their existing 2D analysis. Also, doctors can perform TAD planning with confidence on the location. No Impression. Study Model with roots. 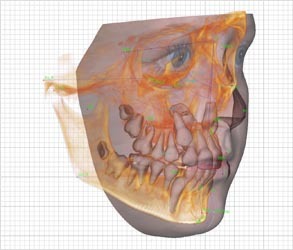 The 3D Analysis module for InVivoDental brings together 2D and 3D Cephalometric Analysis. This revolutionary module has recently been updated with exciting new features. Surgical soft tissue simulations, fully customizable 3D landmarks, and automatic landmark orientation are just a few of the great case presentation and analysis tools. In today’s world there are new technological advancements constantly. With so many different technologies organizing your image data can be challenging. Collage will accept all of your images and display them seamlessly. Streamline your workflow, and save time with Collage. The creators of the award winning InVivo5 3D imaging software are proud to introduce the next generation in dental patient education. Anatomage’s Visage software is a 3D patient education tool wherein virtual procedures can be seen and interacted with from any angle. Patients can visually comprehend their treatment plan like never before. Medical Design Studio is a sophisticated software tool that specializes in the design of 3D models from medical images. Using standard CT or MRI scans, one can create 3D models of the anatomy or import an existing 3D model of a medical device and customize it to fit to the patient’s anatomy. The software could be used for conceptual design, design improvement, clinical validations, and even patient-specific custom manufactured devices. 3D Stitching Plugin is an optional tool for InVivoDental. This plugin can merge multiple small field of view images into single larger field of view image. For example, if your 3D CBCT unit cannot capture both jaws, you can scan the mandible and maxilla separately and merge them using this 3D Stitching Plugin. It is the same process if your scanner cannot capture the entire dental arch. Simply scan the left arch and the right arch and merge them with the 3D Stitching Plugin. An excellent solution when you encounter a limitation with your scanner.